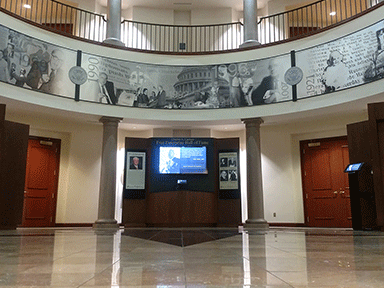 Opening in 2001, the Helms Center features a replica of Senator Helms’ Senate office, an interactive timeline of major events during Helms' Senate career and an exhibit dedicated to the Presidents Helms served with during his 30 years in office. Click image to learn more about our "Preservation of Liberty" and "Hands of Friendship" exhibits. Click image to explore the "Principle Over Politics" timeline. Click image to learn more about Helms and the Presidents. The newly remodeled museum provides visitors a look into the legacy of the late Senator Jesse Helms. The timeline provides insight into significant milestones while the interactive tablets and video provide for a more in-depth look. You can also learn about the relationship Senator Helms had with the seven Presidents he worked with while in office. The Charles A. Cannon Free Enterprise Hall of Fame offers an exclusive inside look into the generosity and leadership of select free enterprise heroes. This interactive museum offers self guided tours during regular operating business hours. 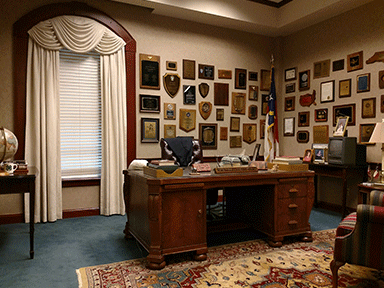 See what it's like to be a Senator in our replica office. Features include authentic artifacts, awards, photographs, the Senator's personal typewriter and more.